The default, trim-to-fit size is 15" x 10.5" and requires trimming to install properly. It is large enough to fit most laptops and gives you the flexibility with the coverage. We'll make your skin to your measurements! Remember - due to production and artwork constraints, the biggest size we can make any laptop skin is 16" x 13". It's easy - scroll down to watch our laptop measuring tips video! 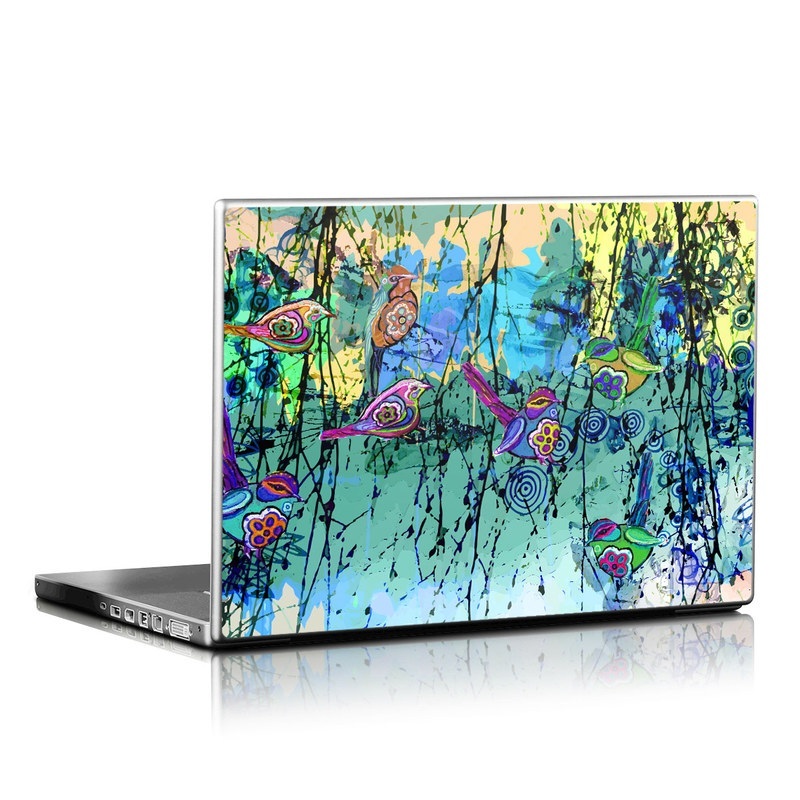 Also available as a Neoprene Laptop Sleeve $29.99 Get this exact same artwork on a padded, protective neoprene sleeve to keep your laptop safe! Features include a soft inner liner, easy top-loading zipper and vibrant full-color printing on one surface. 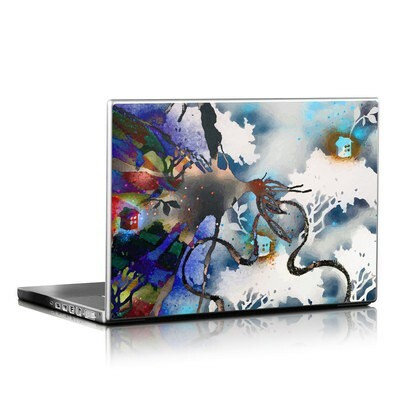 Remember, we offer over 1000 pieces of art as skins for your Universal Laptop. I bought this for my sister, who just got a new laptop, it's a no so well known brand called Lenovo, so I was a little afraid of buying one that wouldn't fit. I was pleasantly surprised to find the universal laptop skins in so many cute styles, I was so excited yesterday when I got it earlier then expected I couldn't wait to give it to her. She was so happy when I gave it to her, and installing it was very simple and easy (the hardest part being getting off the paper) and although a small amount smaller in width, it's not too noticeable and looks very nice! I was so happy and most importunely my sister was. :) I'm sure to buy from here again~. 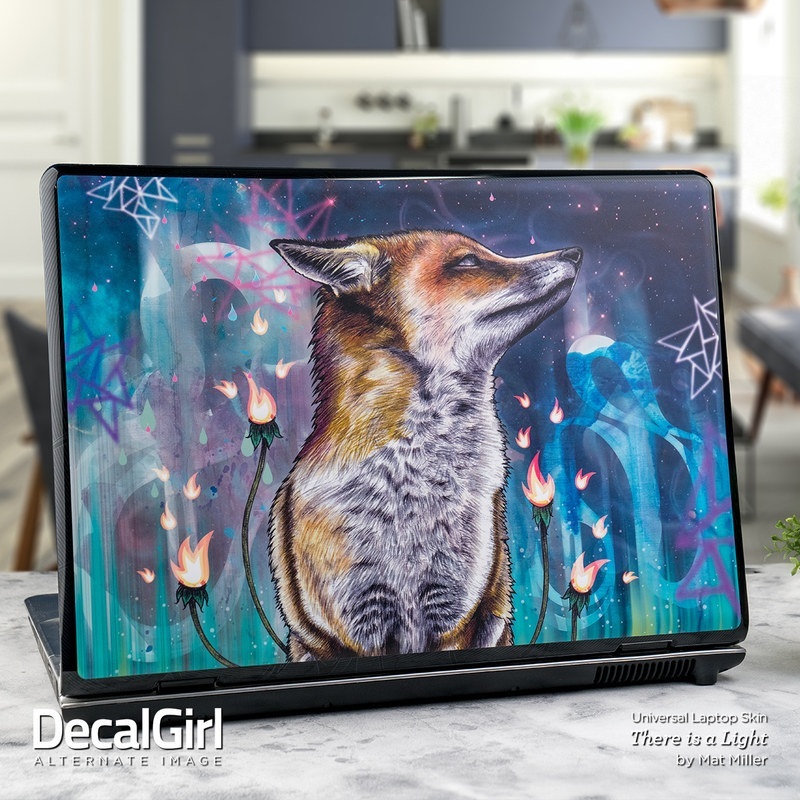 There is so much detail in this design, I love having it on my laptop since it gives me a pretty incentive to keep my laptop closed more often on my desk. One note though, in the future I'd recommend going for the custom sizing instead of the one-size-fits-all cheaper version. I cut it myself to fit my laptop and I didn't make an even line so there's air pockets on one side of the skin after I applied it, and I cut into the pretty little design in the bottom left corner which I didn't want to but it was either that or cut into the fairy's head at the top. 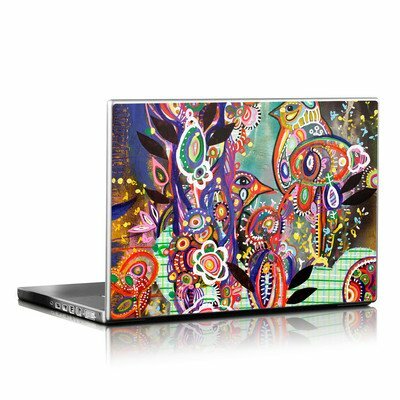 I did use the excess skin to decorate the inner part of my laptop though, so it wasn't a big disappointment, just something you may want to be aware of if you're considering a universal laptop skin purchase. Quality of the skins is great. Trimming round corners is challenging, as the material is quite tough. I would recommend paying the extra $5 for custom sizing if you are buying a generic skin. My wife is quite happy to have this one her laptop, rather than the bland silver top with the Dell logo! This is my 2nd order and I will tell you why. These are the best skins I have seen on any site. I made a mistake and ordered from another company. It was super thin and impossible to apply unless I you like a ton of bubbles. Decal Girl skins are far superior to any skins I have bought. It really is easy to apply and no bubbles! Make Decal Girl your last stop. I adore these artists! And I live in a house where someone has extra computers everywhere, and I always know which is mine. these are the best! I love the texture of the skin, it's smooth but not slippery. I especially love the colors, they're very vibrant! It was really easy to apply. I will definitely buy again! The graphics are sooo beautiful, I can stare at it for hours! I love this skin. It makes my laptop feel brand new! The detail is just amazing. I loved it so much I bought the phone case in the same artwork! I have a Dell Inspiron 15.1 inches and this fit perfectly. I didn't have to do any trimming. It just curves around the top of the screen barely. Love it! Love it. Only bad is on me. Had to trim it and since it fills the sheet lost some of that awesome graphic. I was so excited when i arrived. It even arrived a day earlier than expected. I bought it as a present for my mom... she was so happy. I love DecalGirl's products and i will gladly use these products again in the future. I highly recommend this site to everyone! This was a present for a family member, and she was impressed with how professionally done it looks. It was easy to apply and was just as advertised. I ordered this skin before for my ps4 and I loved it, so I decided to get it for my laptop as well and Decal Girl did not disappoint! I absolutely love this skin (Lavender Flowers)! It's so beautiful: bright and cheery, yet also tranquil. The quality is great and the measurements were perfect as well. I'm very likely to make some other purchases! My laptop wasn't available bought the generic and cut to fit! Looks amazing! I got so many compliments on this design that I just bought it AGAIN for my new computer! I got it in the high-gloss this time and it looks much more like a custom finish than a sticker. Also I sent in my custom size dimensions without subtracting the recommended .5 inch per side. Even though the edges do curve downward slightly, the skin is flexible enough that it didn't ripple when I put it on and it looks AMAZING! 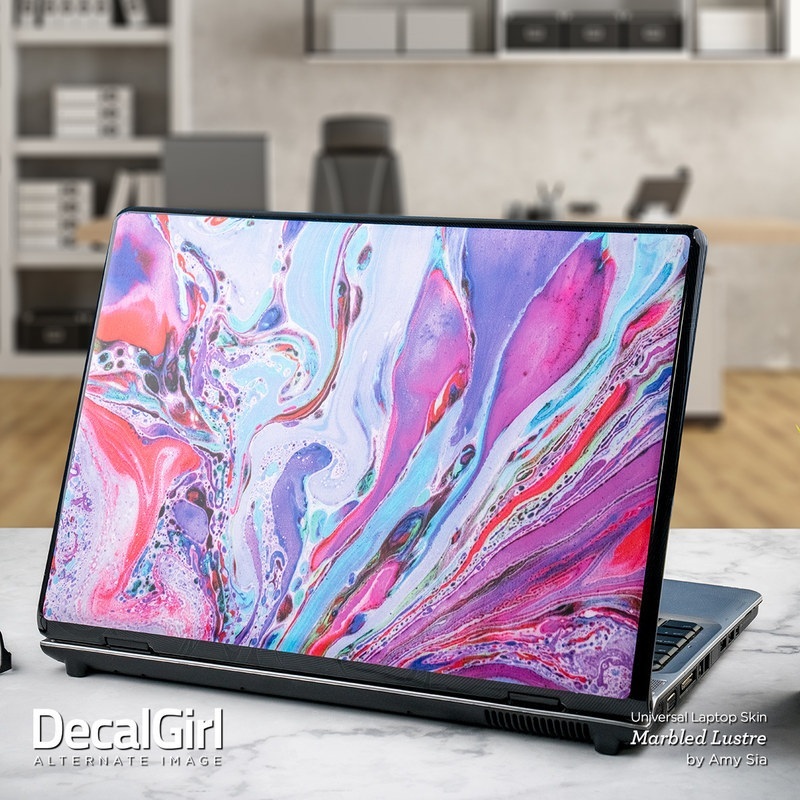 I wish that DecalGirl could make more custom skins and incorporate the curvature into the design. Regardless, this skin is the greatest, especially in high-gloss. Perfect for my laptop! Colorful and cute! Fast shipping. Love this wonderful graphic! The colors are so bright and vibrant! Putting on the skin was very easy and quick. It gives a new look to my old laptop, now I'm sure I won't mistake it with some other laptop! It was just a little difficult to cut to fit perfectly the laptop's features but I managed with an utility knife. I have this on my laptop and love it! Gives his laptop a sleek, industrial look. Love it. I love the look, I cut it to fit my Lonovo Thinkpad and am happy with it. It did take quite an effort to customize it and wouldn't do it again because it is difficult to get a professional looking cut. However I love tge look and quality of the actual product. I love this design and it is so easy to apply. My daughter had been complaining about wanting a new laptop because she didn't like the color. I remembered a co-worker who had a skin on hers so I thought it might be a good solution. I didn't plan to buy anything for myself, but wow, there were just so many cute designs. I had no idea what to expect but figured it wouldn't break the bank to try it. I'm so happy I randomly ended up at this site. I paid extra to customize mine and it fit perfectly. It was ridiculously easy to put on. I now smile every time I look at my laptop. I never smiled at the plain, gray thing before. works great and looks great on my Chromebook. Picture image and size perfect. Classy and perfectly cut to size. Put a serious shine on an older laptop that I was lugging around. It's a beautiful skin for my laptop!! I've had this decal for 4 years now and it still looks amazing! I definitely recommend this. I am in love with this artwork!! Another perfect fit, and just in time -- not a week after application, my laptop found itself in a situation where something in my backpack really wanted to scratch everything else in my backpack. No scratches on my laptop, though,t hanks to this striking skin. Hurray for DecalGirl! My Asus vivobook flip 14" is looking so cool. Have always loved decalgal's skins. The skin itself was beautiful , the pattern was amazing. This image works on all my devices (I like them to match) from laptop to mobile phone and game console (3DS) no matter what color my actual device happens to be. It is so beautiful. I ???? I just got this skin in the mail, and it was absolutely how it looks in the photo - may be even nicer!! I wish I did a better job of cutting it to the size of my laptop. Actually better yet I should have gotten a custom one, but lesson learned next time I will be purchasing a custom one. This decal is perfect because it is not too cliche, but not too flashy either. I love it! Will be purchasing again! Fit/cut to size was easy! Depending on the size of your computer it may even give you some 'wiggle-room' with placement. Went on smooth - no bubbles. Durable. I get comments/questions about it whenever I use my laptop in public. Artwork/Artist (Vlad Studios), product, and 'DecalGirl' are absolutely fantastic! The colors are bright and happy. The quality is excellent and the skin fits my laptop perfectly. I love this skin and all of the designs by French Bull. This skin represents my business style just right. a beautiful depiction for us grown-up ladies of Cinderella. Looks fantastic on my grey laptop. Make sure you have a sharp hobby knife to cut the universal skin to fit your laptop, as it will make the process easier. Its so worth the extra $5 for precision custom sizing, then you dont have to worry about the cut of the outer deminsions The one I got for the keyboard/wrist area of my laptop was easy to cut out the keyboard area with an Xacto knife. It went on smoothly with no bubbles and now i feel confident my new laptop is protected from everyday scuffs. What a great idea and great product. I've been using Decalgirl decals to protect the finish of my Kindle tablets ever since my first one. I loved this Our Town artwork since I saw it and decided to get it for my laptop since I would only see the edges of it on a tablet, and this was perfect. It looks cute and I'm very happy with it. Love the look of the skin. Adds personality along with protection. Application was easy and doesn't leave residue where I had to re-align a little bit. The only thing is trimming to size is a pain, but for the price and design I like, I can get over that. Shipping was crazy fast. I couldn't be happier. I will buy from DecalGirl again!! Color is awesome and the skin was easy to apply! 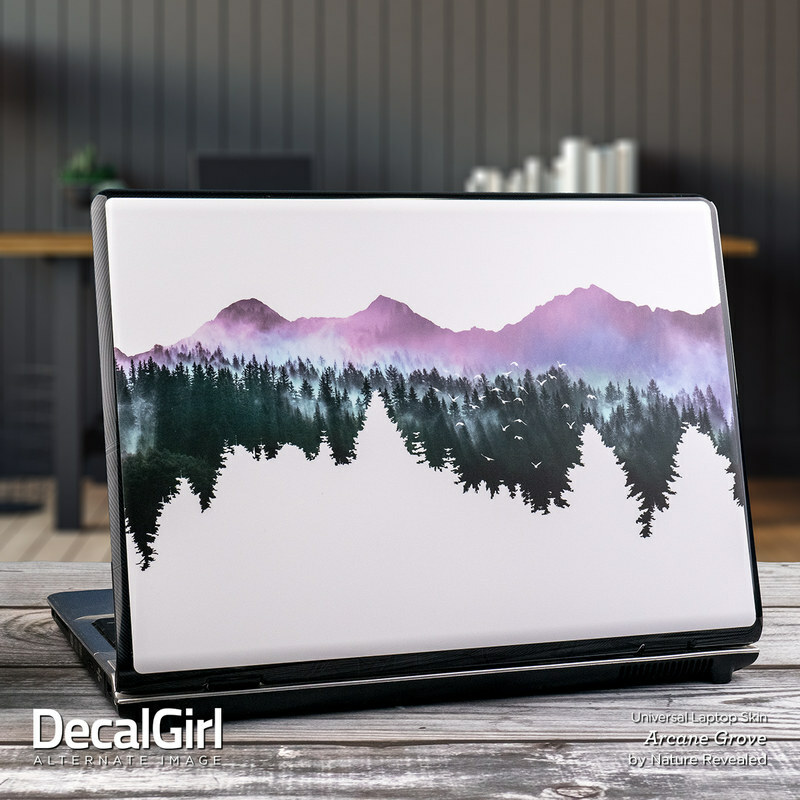 I love DecalGirl and have purchased many skins and decals from them! Got this for my work laptop (there are probably 50 laptops in my office that all look exactly alike). It's pretty, easy to apply, and will be easy to remove if need be. Great image. Applied easily. My husband loves it! I bought one of these in the matte finish for my mother's last laptop right when she got it, and it outlasted the laptop itself. When she got a new one, she ended up getting the exact same skin for it. I've been using DecalGirl stuff for years and years, and at this point I don't even bother looking at other brands. Bought the universal with custom sizing for my Lenovo Yoga. Took a little time to do the cut outs but totally worth it, it looks and feels amazing! My device is so unique now, all thanks to DecalGirl. I'll be buying more in the future! Another gorgeous design; this time I chose the matte finish and it's really lovely to see (and nice to touch!). This particular laptop sits between myself and clients, so I appreciate how dynamic-yet-soothing this design is in large format. Don't let the word, "dark," dissuade you from buying this skin. It's not so dark that it doesn't look like real wood. Very nice. I love the print but there’s no way to cut it to fit my laptop without loosing part of the design. Does this skin make my behemoth HP look cute? Why yes. Yes it most certainly does. Thanks for adding some flair to a beloved but dowdy 17" workhorse. I love you Decal Girl. Got my skin, easy to put on, and my Lapy-top, looks great. Next I will get my sleeve with the same Dave April Infinity art work. Thanks guys. Absolutely love this skin...thick enough to take the knocks and remains incredibly clear (not cloudy from repeated little scratches) and colorful, unique and easy to find on a busy desk! Love this artwork! This is for my leisure-time PC, and it really sets the mood! I have this skin on the last retro iPod that was sold. I have an iPhone - so I didn’t need a duplicate without calling capabilities! It looks great - POP!!!!!!! beautiful design, order the glossy finish, is cuter! Beautiful design, so vibrant. I'm absolutely obsessed. Look very beautiful. 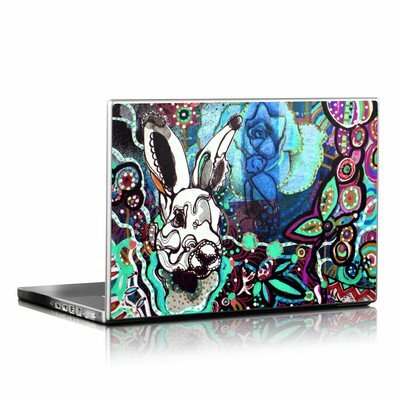 My daughter loves this design on her chrome book. Loved this design. I ordered the full universal laptop skin size and used it for a Dell tablet. I was able to use the skin to cover both the top and bottom of the tablet, and even the two areas on the side of the touchpad. This is a stunning scene. The ease of use is a huge plus! I used this skin on the keyboard area of my Dell. I was able to fit it perfectly! The scene is absolutely beautiful as well! This looks great on my black laptop. It's nice to have something neat but not super flashy for my laptop during class and study sessions. I love this skin, Light of the Poppy. It is whimsical and girly, and it gives my laptop a personality and sweetness that otherwise would not have. The colours on the skin I got are identical to the photo on the website. The skin is easy to apply, remove and apply again, and it sticks properly, bubble free. I bought an Universal laptop skin, so I had to cut it to adjust it to my laptop, but that was easy and it looks great despite the cut. My only 'complaint' is the shipping costs for purchases outside the USA, which, in my case, were almost as much as the skin itself. If that weren't the case, I would buy skins and sleeves for my many gadgets. Shopping from Decalgirl is always a pleasure. I love my wolves. They are so detail. The colours are great and the product met my expectations. Worth the money. Very easy to apply and trim. My laptop looks amazing now! Looks beautiful on my laptop! The colors in the Red Hot Jazz are very vibrant in person. I bought a custom skin and the fit is perfect using the measuring guide video. I put the skin on my laptop, then decided to take it off and reposition it. I had no problems taking it off, the vinyl is thick enough that it won't tear, and had very few bubbles to get out after the reposition. The skin was easy to put on using the directions. This was so easy to put on my new laptop! Now my laptop is protected from scratches. I love the vibrant colors yet it isn't overly loud as a skin! I've received so many compliments and have had many people asking me where I got it! Thank you! This design is very space-y. I love it! Very cool design, especially when I'm doing computer programming. I simply love this particular design, Purple Crown by Kate McRostie. The colors are so beautifully matched and I can say after extensively searching this is my favorite piece of artwork and it suits my style perfectly! So pretty!! Purchased in 2014 and still looks brand new! I've gotten so many compliments. I was finally able to put this skin on my plain laptop and I love it. The mint is beautiful and really gives my laptop a nice pop of color without being distracting to others. It really fits my gaming laptop well! The skin looks exactly as it does in the picture, the application is easy as long as you follow instructions/apply carefully and it looks great! A nice makeover for my laptop. I have been looking for this forever. And here you go. I found it here. Fits perfectly and it is beautiful! I will definitely buy more decals! The computer skin was really easy to peel off and put on. It came in good condition and it is made of a good and sturdy, but flexible, material. It sticks on and stays on very well. This would be a 5 star but the corners are not snug. I think the graphic is beautiful! It was definitely easy to apply, and I did not have a problem with air bubbles. I just wish I would have gotten the glossy finish. The matte finish looks nicer in the video than it does in person. Skin is nice quality as usual, this is my fourth. I like the design and apparently others do too. My only complaint is the sizing. I had to order custom sizing for a Windows laptop this time. The site recommends 1/4 inch shorter on each side. That seemed way to big and I ordered 1/8 inch shorter. The skin came and was even shorter than that. I should have ordered the exact measurement of the top, that would have fit much better. I also ordered rounded corners but they seemed pretty square and I had to cut those off. It fits ok just not as polished as the exact sizing you get with supported computers like macs. It was really pretty when I got it. I liked how easy it was to put on my laptop. Love the design, but is slightly too small for my laptop. Would have paid the extra to have it measured to the size I requested. I get so many comments about this cover. I have purchased covers previously and will come back again when I need another. These covers are great. They go on smoothly, stay in place and look great. I actually used this on the inside of my laptop as the cover. I pressed it on and trimmed it with a razor. It looks beautiful and went on perfectly. This makes my laptop look so amazing. Super easy to apply. LOVE! This turned out absolutely amazing and I couldn't ask for a more authentic looking skin. I got the universal skin with a gloss finish and loved the way it turned out. It looks beautiful! As a gift for my sister, she couldn't stop looking at it and claimed it was absolutely adorable. This was a gift for my sister and she loved it! Such a beautiful print! Cheshire's are my favorite....unfortunately I should have ordered a custom size. I didn't read the sizing through very well. I will return it with my custom size order for the same skin, if I can figure out how to do that. I like this skin. I like the underwater theme. I love the design, and somewhat easy to apply. I wish there were some directions for difficult to fit laptops because my laptop doesn't have any straight edges for me to line up the skin, so it didn't go on properly. Other than that it's great! This skin was a gift for my step-daughter and her new laptop, which was on the larger side. She really liked it on her laptop. However we had to email for the wallpaper since we ordered a full size skin, and didn't receive a code with the order. Email response was fast and she loves how she gets to see the design with the wallpaper. I ordered the glossy version and I just love the way it looks on my HP laptop. I ordered a second one because the first one didn't fit quite right. Re-ordered the glossy version and still love it. So pretty on my laptop! The color and artwork was fabulous. 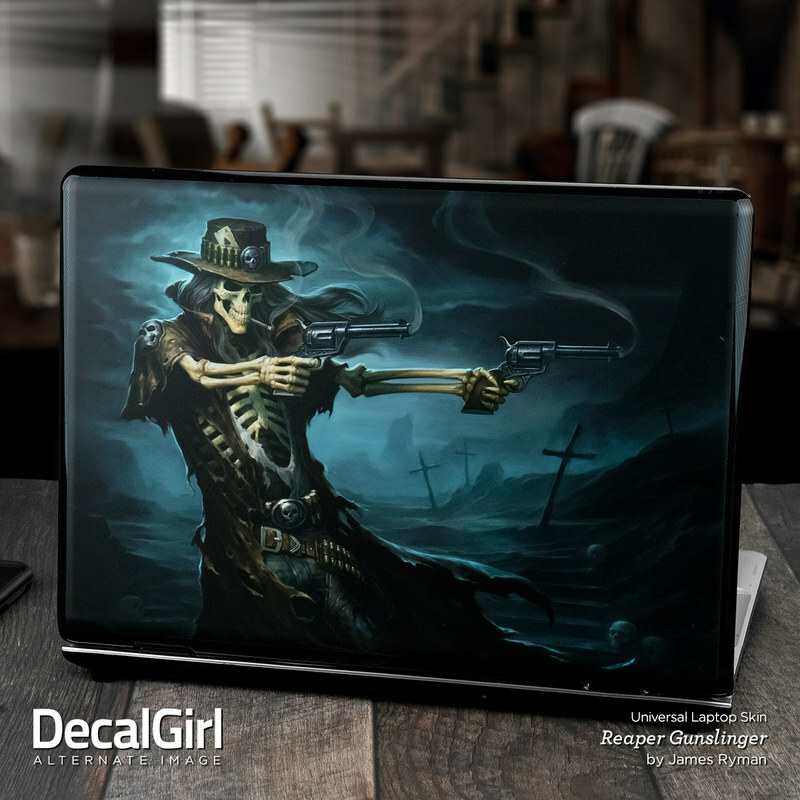 This skin fits my laptop perfectly, it fits my personality too! I love the compass and my next purchase will be a sleeve. Easy to use and went on smoothly. Had to cut to fit but material was very user friendly. My daughter loved it! Unique design that even the GM at the company I work for noticed. Modern and edgy. Fit my laptop very well. Hummingbirds are my spirit animal, love meeting her every day! I got my laptop skin in the mail today and it looks awesome. I plan on ordering a laptop sleeve soon to go with my new laptop skin. This skin is Beautiful! Stunningly gorgeous is what everyone says about my new skin and I am a huge little mermaid lover! Quality is awesome, I had mine custom ordered for size and it still was a little big and trimming it was awful. So that was the one and only complaint it also was really easy to smooth out! Just wish it would have got perfect so I didn't have to trim it , I have very unsteady hands. This is a beautiful design! I love the colors and the natural look of the leaf veins. Looks like stained glass! It certainly makes my boring black laptop look 100% better. The only trouble I had was with the trimming to size, and that's because I have a hard time steering a straight line with scissors! Once I'd accomplished that, the installation was a snap! The adhesive is not so sticky that it bonds the instant it touches the surface, so it's easy to adjust it until it's in exactly the right spot before pressing it on permanently. 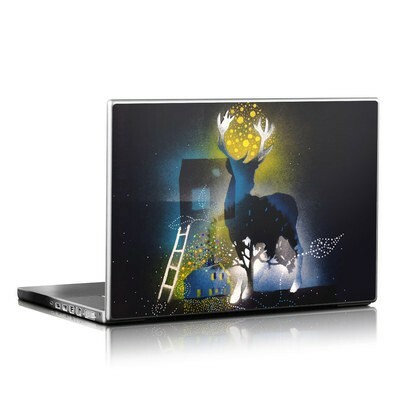 The material is flexible enough to conform to the slight curve of the laptop lid, so it looks just lovely! I've used your skins for my phones and my Kindle, and this was another worthy addition! First skin purchased. I really like the quality of the skin, but I got it from the package with some creases and folds. Regardless, it still looked nice once I applied it after several minutes of trying to do so. I've gotten so many compliments on this! It's amazing! Understated but really pretty piece. Since my laptop is gray, it gives the appearance that the leaf is sitting on the laptop's cover, and the edges of the skin are less noticeable. I just changed laptops at work and it was easy to peel off of my old one and left very little sign of its former presence. I just purchased a new one for my new work laptop. Beautiful product. Perfect Sizing. Thank you so much! Easy to apply and a wonderful design! why? cuz its the sharpest skin there is bar none, completely rejuvenates an older device and decalgirls custom cuts are bang on with the measurements i provided. perfect! Not only does it make my computer look great it also keeps it clean. Decal applied beautifully to the computer without bubbles or ripples. Very happy we ordered from DecalGirl! Looks great on my laptop. I have been looking at this artwork for a while. Glad I finally got it. The colors are great and liven up the laptop. I love seeing all my favorite blues every day! Looks absolutely amazing & my boyfriend loves it! It trimmed down perfectly & was easy to work with. Plus, it's absolutely beautiful! Amazing! Very happy with my purchase.